How To Wear A Swing Dress: Swing dress belongs to the dancing and the fun-loving era of the 40s, the dance halls in the 40s saw girls who wanted to be liberated and danced their way through life. Basically this brought on the waist fitted and leg showing ballooning dress which moved with the dancing girls beautifully showing their figures. 1950s brought a little more extravagance, little more flare and cloth to the swing dress. 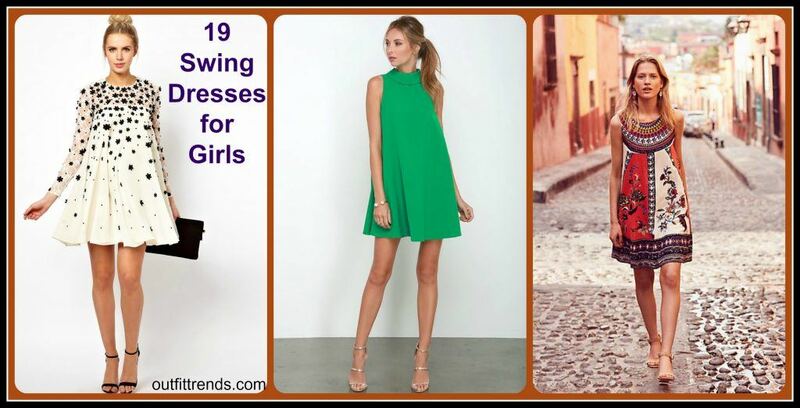 So keeping the history in mind girls today can choose to wear the same style swing dresses if opting for a fun day outing or if planning to move on the dance floor. For other times you should choose other newer versions of swing dresses as the layered ones or frilled. This dress looks especially nice on plus size women as gives them a flatteringly lovely look for the summers. Enjoy the best options below. This beautiful outfit in pale blue is a perfect dress for any plus size girl as it accentuates your look and adds style and sophistication. Wear heeled sandals with tied hair. An all white is the color of the hot season. Wear it to your friends day time party or to a lunch in the sweltering heat. Be a vision and wear all accessories in the same tone. White clutch and shoes to diamond studs. Going shopping or to the beach, this ethnic embroided and patterned outfit with a statement necklace and a shoulder bad will look superb on everyone. Choose brown combo with white this season.. If planning to go to a party,this lime yellow frock will make heads turn. but let the dress do the talking and keep everything else low key. Put on small studs and white heels and that it for your prep with this piece. Lilac gives a feeling of coolness and calmness. Opt for this layered swing dress for an office party as it is decent and elegant. Shopping spree in summers can be a bit tiring in the heat so go for this gorgeous outfit in plum matched perfectly with a fedora hat and gladiators and ethnically styled hand bag. Beach parties call for simple dresses yet styling looks. This frock in cotton is absolutely gorgeous for a day out in the sun. Swing dresses are not restricted to summers but can be styled for the winters as shown with long thigh high boots and a jacket. A classic dress you must invest in with a turtle neck giving a modest feeling yet adding sophistication that no one can beat when worn with golden heels and a rough pony tail.